Russell is my Norwegian Import from Kennel Saeterelva - Monica and Oivind Berger. 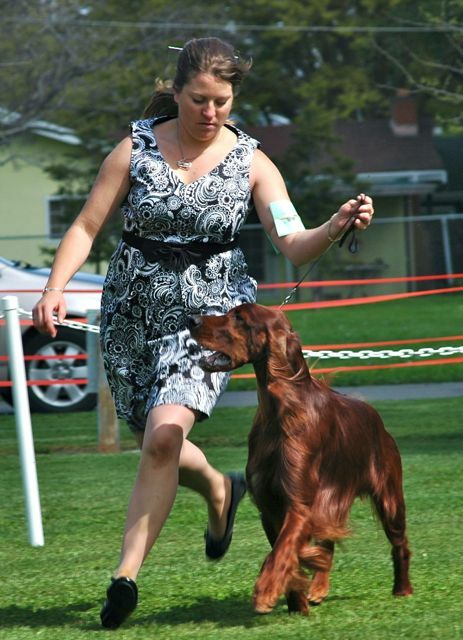 He brings to North America that country's committment to versatile Irish Setters. He is a strong, dark mahogany dog, with an extremely willing and high drive temperament. He is physically tough, yet sensitive and biddable to training pressure. 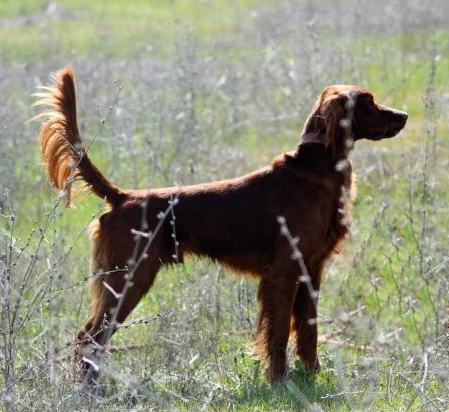 His excellent nose, natural retrieve, inborn water love, and strong point make him the obvious choice as a sire for versatile breeding programs but he is an active high drive dog who loves to work and needs to work, and he passes this along to his get. His style on point is "traditional" but his drive and toughness afield fit well with the requirements of today's trialers. The depth of talent in this pedigree is above average as far as families of dogs with strong desire to work, to point, to run, and to look good doing it. His coat is excellent quality, very moderate of length, and protective. What you see in this photo is what you get. Strong, old fashioned, moderate, and sound. Russell is currently living with Don and Gail and is at stud by private treaty by contacting Russell Irish Setters. More Photos and Pedigree of Russell Here! Jack, what can I say about Jack? This dog is a delight! Gregarious, happy ALL THE TIME, always up for adventure, and a bird finding machine! Jack is a CKC Championship and a four point AKC major. Trialed sparingly as a young dog he has AKC and CKC Derby and broke stake wins to his credit. * BC All Breed Pointer Club #1 Derby Dog for 2009. Jack yard broke kindly for me, and was finished up by Pro Trena Cardwell. More Photos and Pedigree of Jack Here! 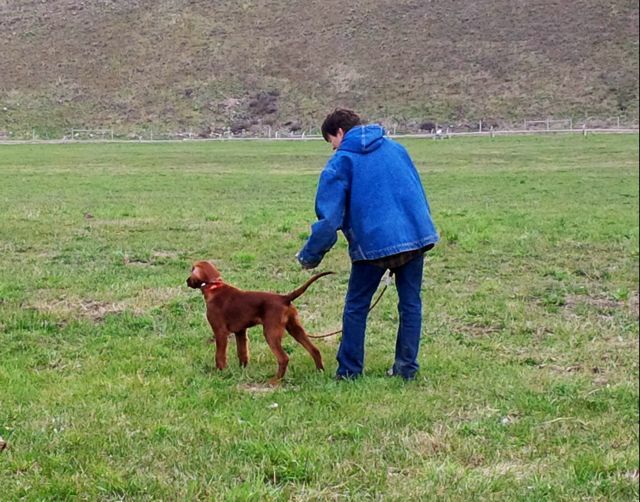 John is a lovely young male who at two years old has multiple CKC and AKC puppy and derby stake placements as well as a 4th place in the Derby Classic at the 2011 ISCA National Field Trial. I would consider placing John on a co-ownership to the right field trial home by private treaty. Opie is photographed here at 16 months old. He is an easy dog to train, easy to live with, and, as his names says, he is an optimistic fellow! 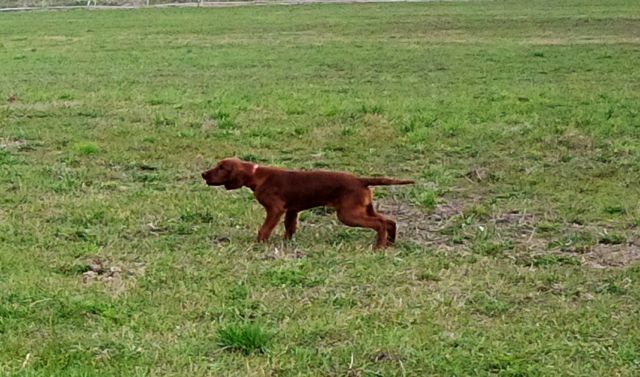 Loads of natural ability, natural retrieve, and naturally forward race. Congratulations and thanks to Mark Bunter for buying Opie and giving him a loving home! Russell's Punchline (Am FC Brophy's Rio Grande X Russell's Kibou) - FOR SALE see available page. Paddy is our German Import from Kennel Lohmann - Andreas and Christiane Lohmann in Germany. 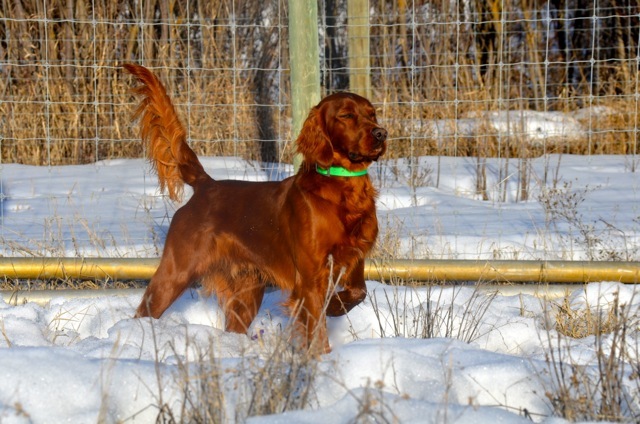 Here is another European import dog that will bring strong versatile influences to the Russell Irish Setter program. 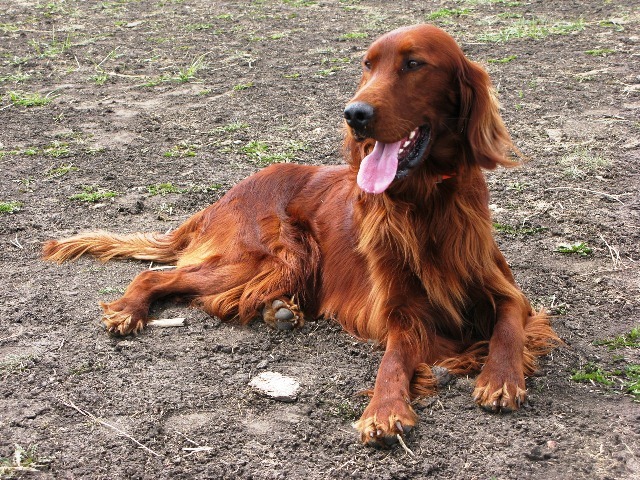 Paddy is a lovely standard Irish Setter of excellent heritage. He is easy to live with, easy to train, and has excellent structure as well as correct coat and temperament. Paddy resides in Alberta and Saskatchewan where wild birds are abundant - so necessary for the development of a young dog. We are grateful to Andreas and Christiane for sending us Paddy and we look forward to using him in our program. More Photos and pedigree of Paddy Here! Musashi is the consumate Irish Gentleman son of a Best in Specialty winning Sire and a Dual Champion Dam! He is gentle, kind, willing, and fun loving. He has loads of natural desire to point, good range, and he is a good looking and well put together fellow as well. His pedigree is deep with Champions both field and show, Register of Merits, Best in Show winners and more. Musashi has been on a co-ownership with Dotti Fowler of MyTyme Irish Setters in Texas and she finished his American Kennel Club Show Championship. Musashi finished his Canadian Kennel Club Show Championsip in two weekends with multiple BOW and a BOB. We hope to run him more in the field, but we fear a cruciate injury from a puppy hood accident may forestall his career. Watch for more news on that as time goes by. At stud by private treaty. Currently residing in Maryland, USA with Bill. More Photos and Pedigree of Musashi Here!